You deserve to get more of the good stuff – and Tiffany’s Loyalty Program is the way to do it! 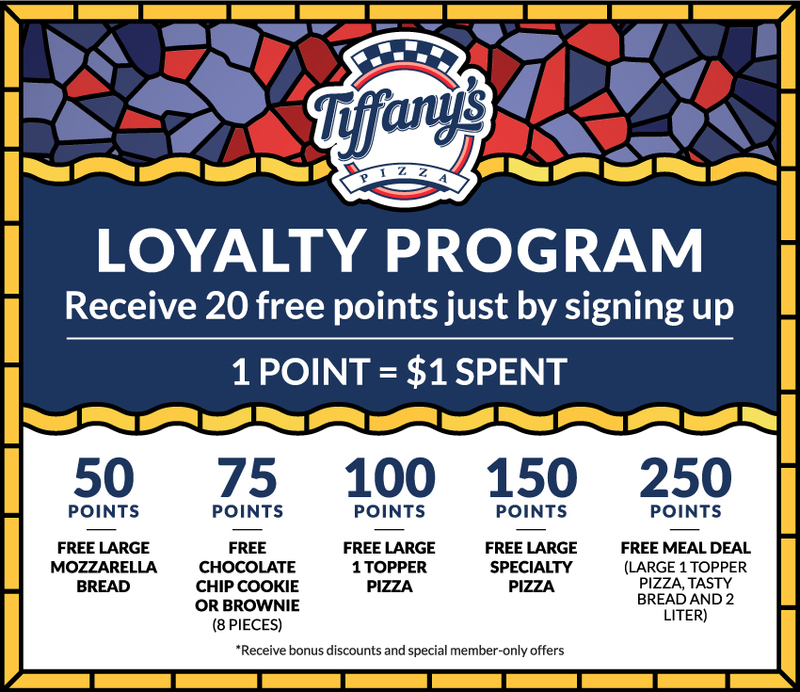 As a member of our loyalty program, you earn points for every dollar you spend – and after just a few visits, you can redeem your points for free food. But that’s not all: We’ll send you special members-only offers, discounts and announcements that will save you big money on future orders. Joining Tiffany’s Loyalty Program is easy. Just create an account with us using the link below. Besides becoming a valued member of our program, you’ll be able to place orders more quickly and keep track of your orders with us. Of course, all of your information is strictly confidential. Check out how quickly you can earn free food from Tiffany’s! Live large and save big! Special deals and combos put extra food on your table – and keep more money in your pocket. Get more, save more with Tiffany's Loyalty Program. Know what you want? Call the Tiffany’s nearest you to get your pizza hot, fresh, and fast.